anyone playing this build on BSC? how is dmg against shaper / uber elder? Are there any option to change abysus with another good helmet? in passive tree can I change berserking with duality? berserking better? - AoE DPS is amazing. Consecrated Path is very good fit for lazy person such as myself. - Tectonic is also great for clearing. - Syndicates and end-game bosses can hit very hard and result in deaths. - Izaro's slam nearly 1 shots me when wearing Abyssus. Crit would definitely kill me. - Big moves from T16 guardians are very dangerous. Not to mention shaper projectiles kills me in 1-2 hits.. Slam is instant death. I've spent about 25 exalted on the gear, but so far this build doesn't seem to be as THICC as advertised. Despite not being the tankiest build around, gameplay is very much fun. I'm coming from HoWA CI build with 9.8k ES and it was a lot more durable, but unfortunately claws don't have any enjoyable skills that can both clear and kill bosses fast enough. HoWA CI can actually take a Shaper slam without dying. Did you use cinderswallow urn for shaper? I had Sapphire Flask there, but HP pool seems to be just too small with Abyssus. I had a bit easier time with a rare helmet. Also slow movement speed takes a while to get used to. Why use Purity of Ice AND 80% Loreweave for Uber Elder? I thought the Max Res of Loreweave doesn't stack with other sources? I have the same experience here. 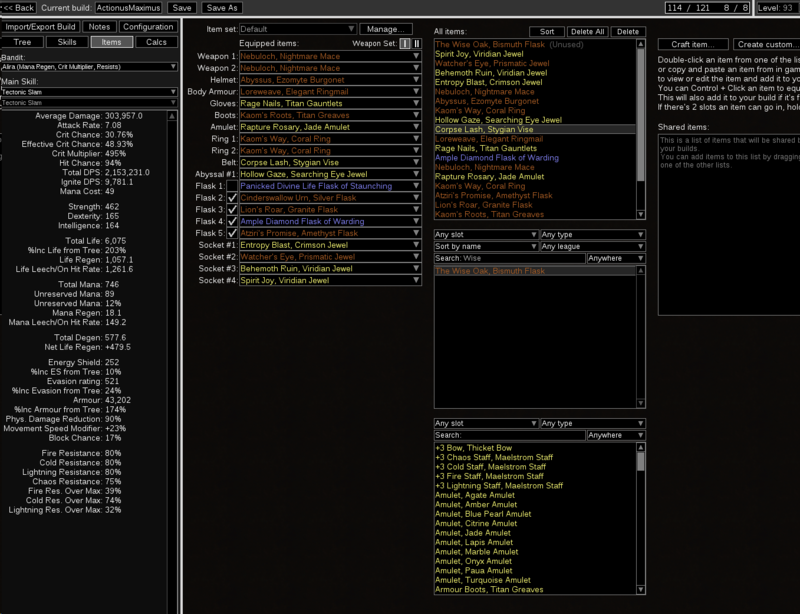 Tectonic Slam consumes too much charges and I used to have just a few of them, lowering the Defense and DPS. I'm dying a lot to Syndicates, end-game bosses and guardians. I will try it out without Abyssus. So far I'm disappointed with the build. Well, Abyssus builds are sketchy, in general. You do a lot of damage, but there's also a risk of death too, jugg or not. Abyssus in general is just a giant dps boost at the cost of potential ripperoni. I played a lot with it on my other Frost Blades gladiator build, so got used to it. You ALWAYS need to keep an eye on your endurance charges though. They are everything for jugg. If you have 1 charge, don't expect to facetank things. slam will kill you no matter what. Under 9-10 charges it is very doubtful. Shaper balls is another story, since they can crit and kill instantly. You can always drop abyssus if you are uncomfortable with it or dying too much. Hi there thanks for the build... im new to this and i have a question...how do you use Hatred??? once the ash and purity active there is no mana left for other skill.